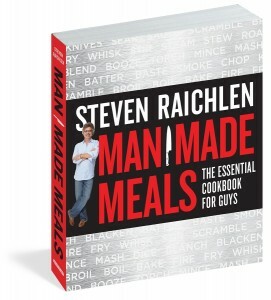 Welcome to our latest series on BarbecueBible.com—Food Dudes—featuring interviews with the movers and shakers of the food world, excerpted from Man Made Meals: The Essential Cookbook for Guys. Up first: überchef Thomas Keller. He is the author of five cookbooks, most recently the #1 New York Times bestseller Bouchon Bakery. The full text can be found in Man Made Meals on page 92. 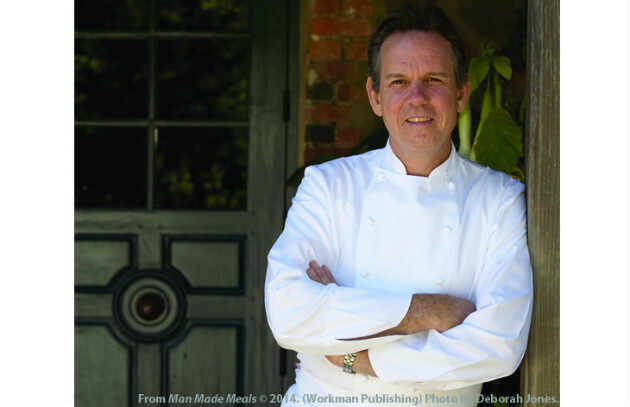 Thomas Keller presides over an empire that includes restaurants, bistros, bakeries, and food products. He remains as notorious for his dry sense of humor as for his fanatic attention to detail. He’s the sort of chef who might serve a rack of rabbit with its bones impeccably frenched (scraped clean) so that it looks for all the world like a rack of lamb the size of a postage stamp. In the course of a meal at The French Laundry you might dine on “tongue and cheek” (incredibly delicate braised veal tongue and beef cheeks) and “oysters and pearls” (made with Malpeque oysters and osetra caviar). Dinner at The French Laundry or Per Se will set you back several hundred dollars per person and that’s before wine, tax, and tip. But the meal will be so unforgettable and the experience so extraordinary, you may actually feel like you got a bargain. Keller sums up his philosophy this way: “Respect for food is respect for life, for who we are and what we do.” Amen. Get Keller’s recipe for his Spanglish Sandwich. Hamburger Helper. Hey, I was thirteen years old. Why is it important for men to know how to cook? Cooking gives you a sense of self-confidence, self-sustainability, and individuality. It enables you to take care of yourself, which is one of the most essential human needs. The Spanglish Sandwich. Basically, it’s a bacon, lettuce, and tomato sandwich with fried egg and melted cheese. If you haven’t seen the romantic comedy Spanglish, I recommend that you rent it. Well, I don’t really cook at home. But I’m likely to eat something like quinoa with hummus. Maybe with cooked beans, avocados, or a can of tuna on top. I keep it pretty healthy. What’s your favorite seduction menu? Simple and to the point. Champagne and caviar to start. Pasta and truffles. Some kind of chocolate for dessert. Most women find that if you extend yourself, if you can handle yourself in the kitchen, that’s seductive enough in itself. A roast chicken. This isn’t complicated, but you have to start with a really good bird and let it sit, uncovered, in the refrigerator for a day or two to dry out the skin. (This helps crisp the skin, which is the best part of any roast chicken.) It’s also important to “temper” the bird, that is, let it come to room temperature before cooking. And roast it in a hot oven (425°F). Unsalted butter. Salt was once added to butter as a preservative. That isn’t necessary today, of course, but, when cooking with butter, I like to add my own salt to taste. Salt. At the restaurants we use non-iodized kosher salt for cooking. And Maldon salt from England for “finishing” (final seasoning). It’s all sodium chloride, of course, but I like the flaky texture of the Maldon.